While work, sickness, life, etc. have conspired to keep me away from the painting table for much of the year so far, I did have the opportunity to travel down to meet a friend for a fun weekend of family, food, fun, board games... and a nice healthy dose of Bushido. We met up in South Carolina, which meant packing up my little metal men for the long car trip. 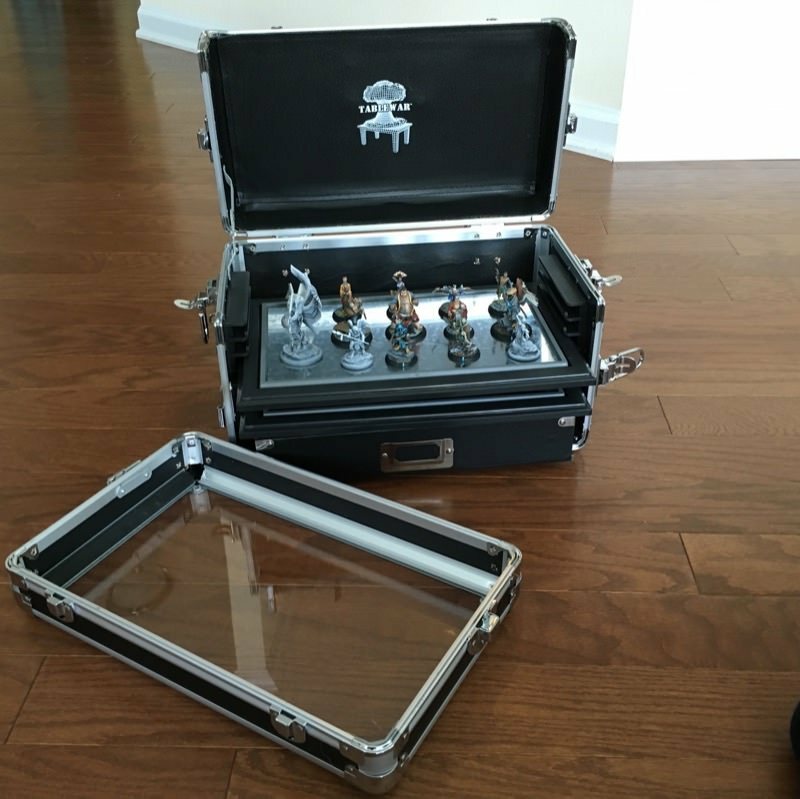 This was the perfect opportunity to put my new Tablewar Mini Case to the test. Spoilers: it performed the task most admirably. The first thing I'll say about the case is that it is tough. I had absolutely no fears about the safety of my minis once they were ensconced within this thing. 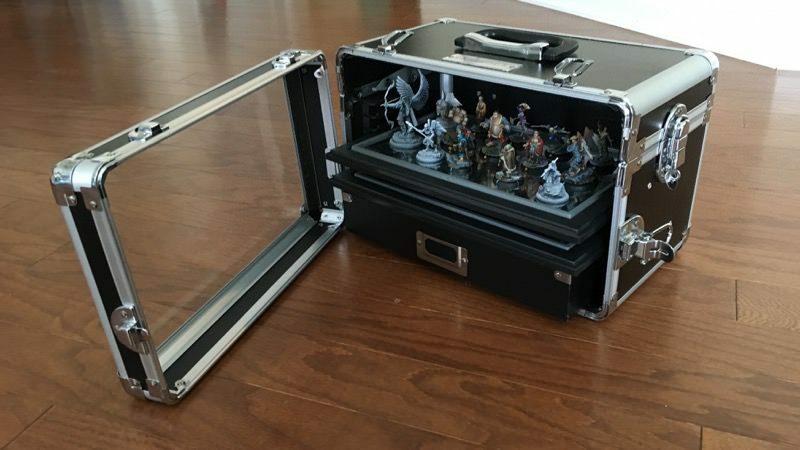 That's not to say I want it bashed about, but after using a Battlefoam case for my Infinity minis for the past couple of years, the shear weight and ruggedness of the Tablewar case instilled in me a new, resounding confidence. The next thing to say is that it's very attractive. Ok... it might resemble a makeup case just a little bit, but the confidence that I mentioned above is enough to give me a certain, hard-edged look in my eyes. Anyone mistaking this for a makeup case need only take one glance at my visage to know “no... that's no makeup case. This man is protecting toy soldiers!”. Well... that's the theory at least! Joking aside, I really like the look and the little peek in through the glass front to see your minis nicely arrayed is a fun touch. Inside the case, I have two trays (although only one is currently in use) and a drawer. One thing to note is that the case, out of the box, doesn't include the metal unit trays - just the display board/drawers. Thankfully, my wife, who picked this up for me for xmas, caught that little detail and added the metal trays to her order. 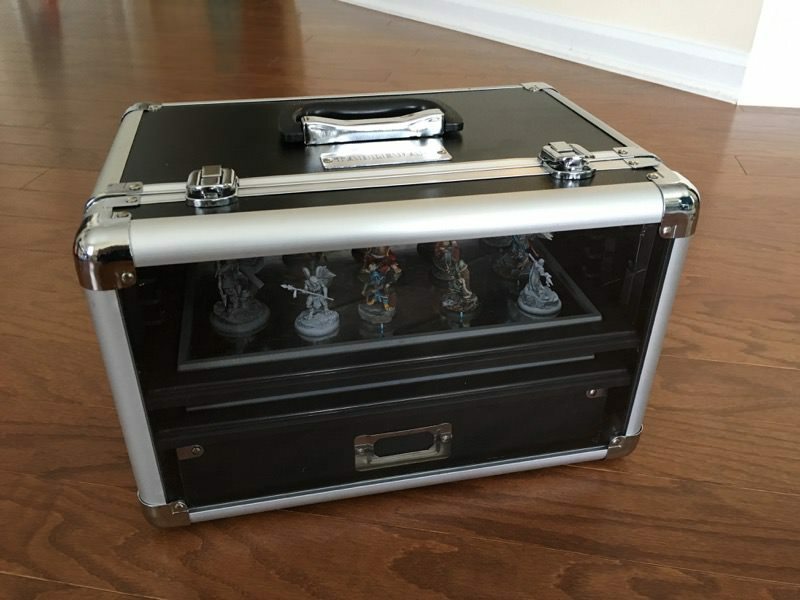 As Tablewar sells two larger cases than this one, I was hoping that this, their "mini" size, would be large enough. Fortunately, the case is plenty big enough for my needs. 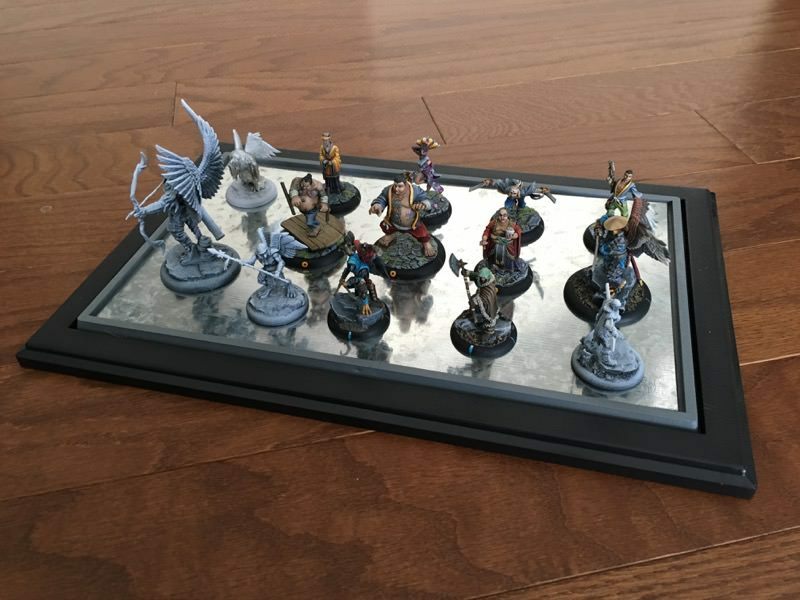 On the one tray I'm currently using, I can completely fit both my Silvermoon and Tengu warbands for Bushido with plenty of free space to expand and add more minis over time. Tablewar carries plastic unit trays with holes cut out to fit various sized bases, but I find the magnets strong enough that I can barely remove the minis from the tray sometimes - I have no worries of them slipping around on the metal base. Using just the plain metal base, I can then move the minis as close together as I'm comfortable with to fit more or give the odd mini some extra room. My one and only challenge right now is Buzenbo, my big Tengu miniature whose large wings make him easily twice as tall as most of the other miniatures in the case. At the moment, it's not an issue as I can set the tray down low in the case. However, this does preclude me from using both trays. However, this is less the fault of the case and more the challenges of having a really nice, big miniature. 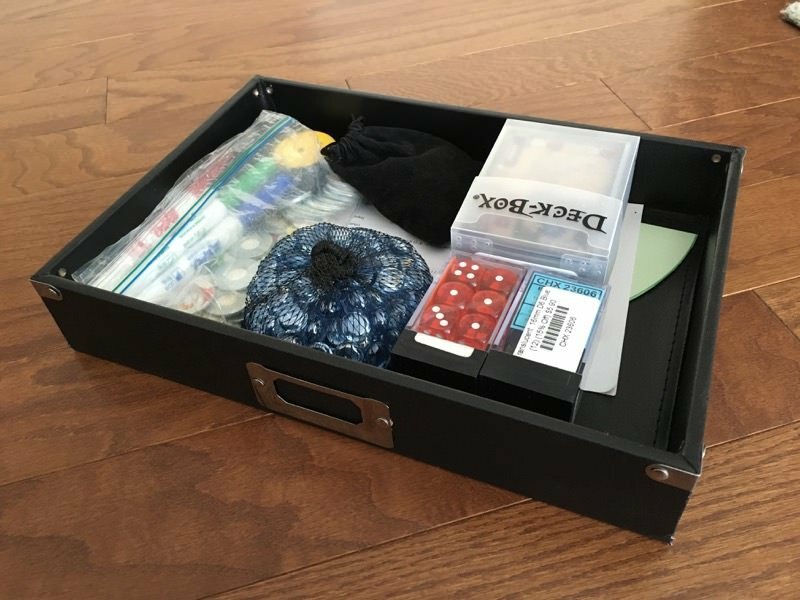 In addition to the two trays, the bottom of the case includes a simple drawer that has enough room for me to fit all of my various dice, markers, templates, cards, pens, etc. While you're not going to fit any rule books in here, I have both the Bushido rules PDF and the Infinity wiki easily accessible on my phone, so I'm not much of one for carting around heavy rule books anyway. After the travel time, the other place where this case is really fantastic is when setting down to play. I pulled out my drawer o'stuff and my tray o'minis, set them down next to our game board and was ready. When the game was over, it was quick and easy to pick my minis off the table, then place them back on the tray and slide it into the case again. Contrast this with the careful plucking of minis out of the foam case and then placing them back in again, careful which mini fits in which slot and to get them placed so they won't jostle around too much and rub up against the paint jobs in transit. Having the minis sat safely on their metal tray with no fear of them touching other minis or the foam siding (soft as it may be) is a huge improvement. So, after my first outing, I'm a big fan of my new case. I've ordered a bunch more magnets and am eager to affix them to all of my Infinity miniatures so they can join the Bushido minis, riding in comfort in the Tablewar case. A solid two thumbs up.